Weatherproof housing enables mounting outside the station enclosure. This means the station can maintain its weatherproof seal without having to be vented to the atmosphere. Specification: This product meets CE specification EN61326-1 criterion C for ESD, criterion C for Radiated Immunity, criterion C for Fast Transient, criterion B for Conducted Immunity, criterion A for Power Frequency Magnetic Fields, and Class B for Radiated Emissions Group 1. To minimize measurement errors due to ambient RF, use the shortest possible probe cable length and keep the probe cable as far as possible from other cables. 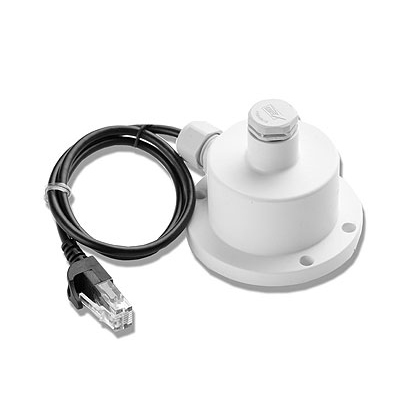 * A single HOBO Weather Station can accommodate 15 data channels and up to 100 m (328 ft) of smart sensor cable (the digital communications portion of the sensor cables).